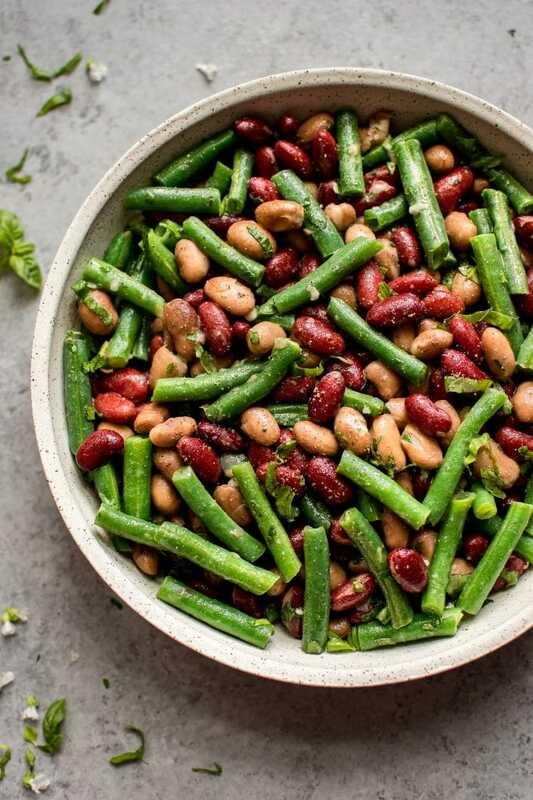 This three bean salad recipe is a fresh twist on the classic! It’s quick, healthy, and delicious. Ready in about 20 minutes! The dressing is a simple vinaigrette with a bit of garlic. It really lets the flavor of the beans shine, and it adds some tanginess to this side dish. I added a touch of honey to give the dressing a slightly sweet flavor without using sugar. I really liked the sweet and sour combo. To give this old fashioned three bean salad an extra pop of flavor, I included some fresh herbs. I added some of my homegrown basil because a) I can’t get enough and b) I have so much of it. This isn’t strictly necessary, but I do think basil brightens anything you add it to, and it’s a nice little addition to this classic three bean salad. I would definitely at least include the parsley if not the basil as well. 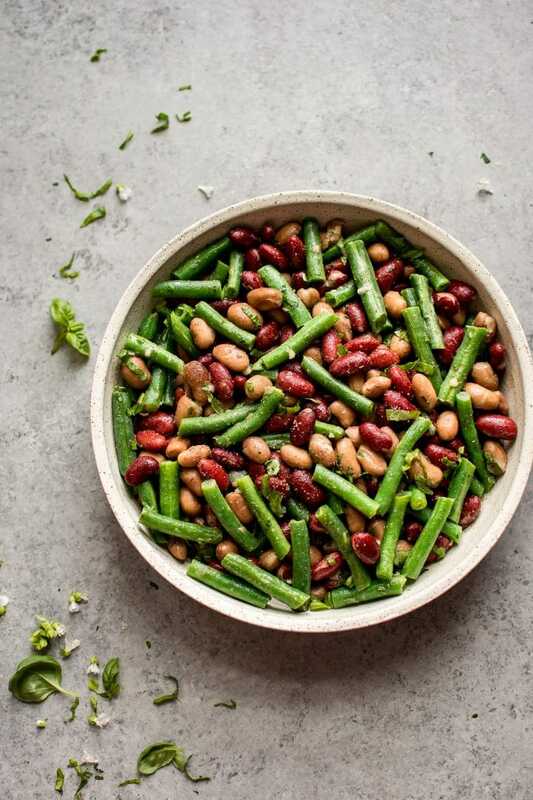 What kind of beans do you use in three bean salad? I’ve seen various beans used in three bean salads. I chose fresh green beans vs. canned because, in my opinion, the little bit of extra work to cook them is worth it in the flavor payoff department. As far as the canned beans go, I chose red kidney beans and romano beans, but that was just a decision based on personal preference and what I thought would offer some contrast in photos. You could use cannellini beans (white kidney beans), chickpeas, navy beans, or whatever other bean floats your boat. I hope you will love this easy make-ahead summer side dish. Did you grow up with a different version of this recipe? Will you make this easy three bean salad recipe? 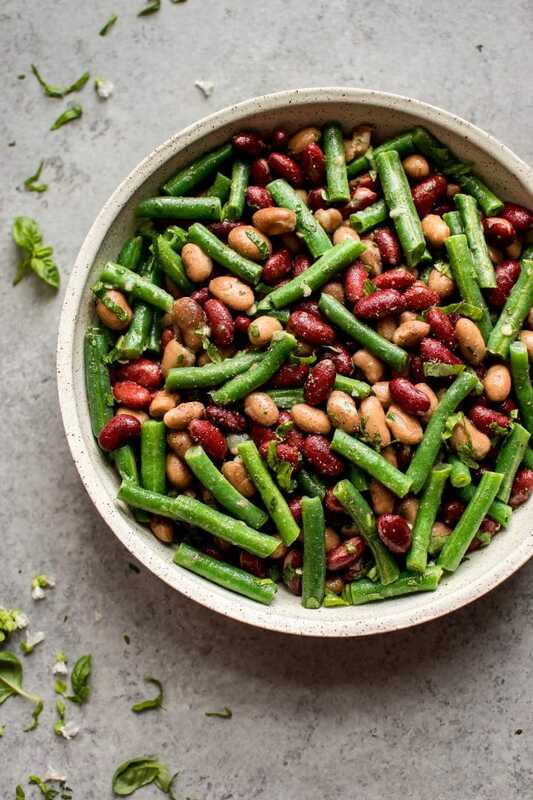 This three bean salad recipe is a fresh twist on the classic! It's quick, healthy, and delicious. Ready in about 20 minutes! Cook your green beans until tender-crisp. I bought one of those packs you can easily microwave, so I did that, but feel free to buy the beans loose and steam/boil/microwave them as you usually would. Once the beans are cooked, rinse them with cold water and let them drain thoroughly. Add them to a medium salad bowl. Meanwhile, add the dressing ingredients to a small bowl and whisk together (or add to a jar and shake). Add the canned beans to the bowl, along with the dressing and herbs. Toss. I recommend chilling it for at least an hour before serving, but you can serve it right away. Salad will keep in the fridge for a few days. Serves 4-6 depending on how much people eat. Feel free to use any kind of beans you like! Adjust ingredient quantities as needed (e.g. more oil or vinegar). I used 19-ounce cans of beans, but if you can't find those, 16-ounce cans would work fine. 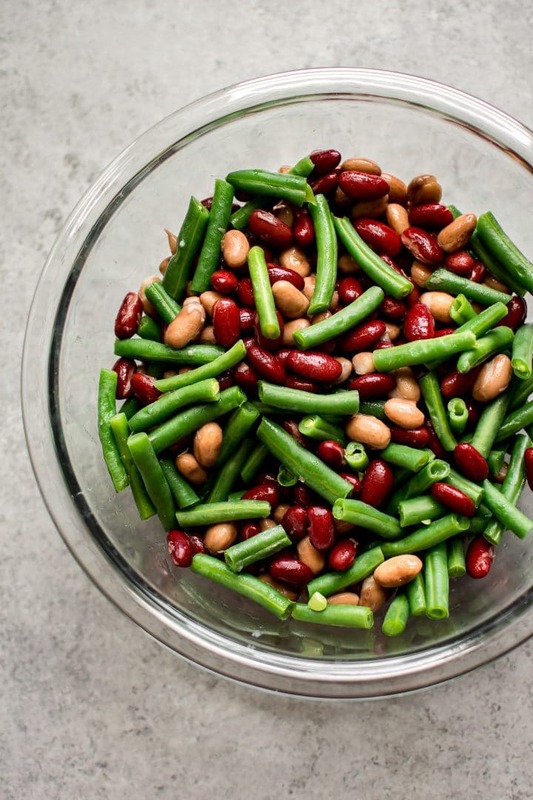 You may also like my easy kidney bean and chickpea salad recipe. Love the light dressing and the fresh herbs in this salad Natasha! I’m always on the lookout for easy, tasty salads like this one! Love that you added some honey to this, it looks amazing! I thought it was a touch healthier than granulated sugar haha. Thanks! Such beautiful photos! I am so excited to try this salad! This is the perfect easy side or light lunch for any day of the week!